Kobe Bryant has reached rarefied air. The Los Angeles Lakers basketball star passed Michael Jordan for third on the NBA's career scoring list Sunday night in a 100-94 victory against the Minnesota Timberwolves. 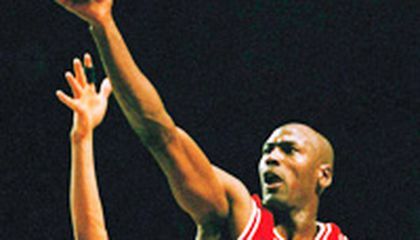 Bryant entered the game needing nine points to pass Jordan, the icon with whom he is often compared. He got the mark with two free throws with 5:24 to play in the second quarter. "I'm just honored to be here, man, to still be playing," Bryant said. "I appreciate being able to play this long. Careers normally don't last this long. I really appreciate the opportunity to still be out there playing and performing and doing what I do." Now, only Kareem Abdul-Jabbar and Karl Malone have scored more points than Bryant. "I congratulate Kobe on reaching this milestone," Jordan, who now is the owner of the Charlotte Hornets, said in a statement. "He's obviously a great player, with a strong work ethic and has an equally strong passion for the game of basketball ... I look forward to seeing what he accomplishes next." Bryant didn't break a record Sunday night. Abdul-Jabbar is still more than 6,000 points ahead of him and in no danger of being caught. But moving past Jordan was cause for celebration. The two players have been linked for years and Bryant often mimicked Jordan from his earliest days in the league, from the way he pumped his fist after big shots to adopting the fade-away jumper as his career has progressed and even sprinkling in a little tongue-wagging on his drives to the bucket as a youth. "He knows how much I've learned from him," Bryant said. "From the other legends, but him in particular." The Timberwolves stopped the game, and the crowd gave Bryant a standing ovation as Wolves owner Glen Taylor presented him with the game ball. With a big smile on his face, Bryant received hugs from teammates and the Timberwolves, and waved to the crowd. Bryant has been chasing Jordan for almost two decades now. He's still one league championship short of the six Jordan won with the Bulls, but has now caught Jordan in the game's defining individual statistic. Bryant had 32,284 points when he took the floor against a Timberwolves team that includes 19-year-old rookies Andrew Wiggins and Zach LaVine, two players who were barely born when Bryant made his NBA debut in 1996. He missed four of his first five field goals. Then he knocked down a 3-pointer midway through the second quarter to pull within two points. He nearly passed Jordan with one of his patented fall-away jumpers from the baseline, but it rimmed out and with 5:24 to play and 24 seconds on the shot clock, No. 24 stepped to the line and calmly swished two free throws to do it. He finished the night with 26 points and 32,310 for his career. It took Bryant 1,269 games to reach the NBA's career scoring podium. Jordan amassed his 32,292 points in 1,039 regular-season games. "Just like we've never seen another player like Michael Jordan, we will never see another player like Kobe Bryant!" Lakers Hall of Famer Magic Johnson tweeted. Moving any further up the list will be a challenge. Malone (36,928) is more than 4,500 points ahead of the 36-year-old Bryant for second place. Abdul-Jabbar (38,387) is on top by a healthy margin. 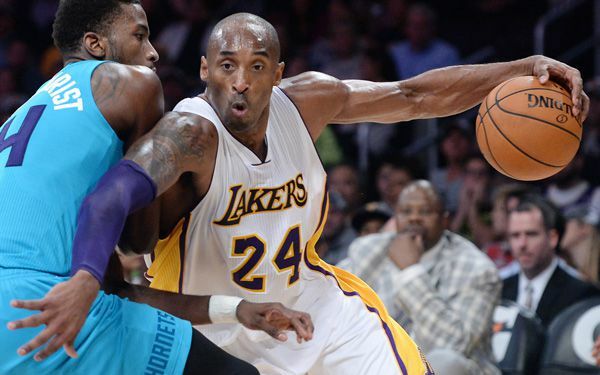 "I think it puts him in the conversation of who is the greatest," Lakers coach Byron Scott said of Bryant. "I think his name's going to be mentioned when it's all said and done. His goal is still to win another championship or two. So we'll have to wait until the book is completed." Critical thinking challenge: Why can Kobe Bryant still move higher on the career scoring list, but Michael Jordan cannot? Great article! Good for Kobe but I think Michael is better. Congratulations to Kobe Bryant, he really earned it and is a good basketball player like Michael Jordan. Kobe Bryant will indeed go down in the history books as one of the greatest of the game. In my eyes, Michael Jordan's legacy shall still be characterized as nothing but great. Although Bryant is 36, he still has a very valid chance at accomplishing pure greatness. My article is about Kobe Bryant and Michael Jordan. Recently Kobe passed Michael Jordan for the all-time scoring list. It is impressive for Kobe, but overall Michael Jordan is the Greatest of all time. Kobe has 5 championship and Jordan has 6 but if you watch a Michael Jordan game you will see how Michael Jordan is better. He comes into the game and makes and makes everyone and the team better by playing defense, passing, and scoring. If Kobe passed the ball more now he could be more in the contention for greatest of all time. Kobe is good but I think that Jordan is better. Thats great for kobe, but i dont think he will ever live up to the michael lead a team.It is a possibillity that kobe may move higher on the scoring list but he has 3-4 years on jordan. Jordan is a legend the only reason Kobe passed him is because he doesn't pass the ball. Jordan passed the ball so that means he didn't get the ball every single play like Kobe would have. That's just my opinion though. I hope some of you can agree with me. Jordan is still better. That's a true statement. I think Michael Jordan is good but I like Stephen Curry better. Lebron he just makes me mad he acts like he is all good but Curry is better, he has good sportsmanship and that is something LeBron lacks.